Well guess what! I finished my 13 in 13 challenge this morning. 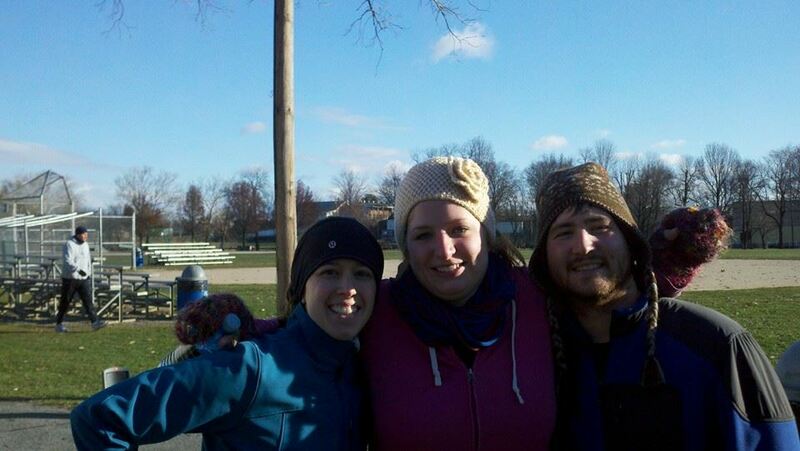 Two dear friends of mine joined me for a local 5k turkey trot. Seriously folks — sign yourself up early for one of these next year. 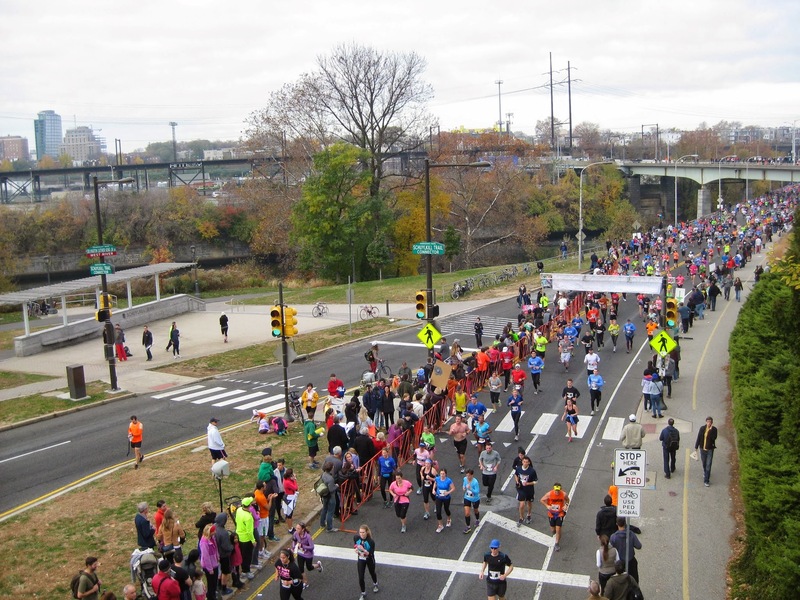 The race itself was a really nice course. It was BITTER cold out and my hips/feet are still bugging me from Philly so Erin and I walked most of it. Jon (her’s…) ran it and did it in an awesome 35+change finish time! For his first 5k ever! Hoping to get them out for some more in 2014! Here is a photo of us after the race!! I’m posting like crazy this morning! 1- Start boot camp. Done. I just did by 5th of 12 classes yesterday. I am REALLY enjoying this and its a definite mood booster. I’m also seeing some change in my body which is awesome! 2 – Train with my trainer. This one has been a little more difficult. I did get in a training session on Wed, but the remainder of the month has been rough — my trainer had a procedure which took her out of commission for a few days. Then I was busy and away for work stuff. Its on my schedule for this week though! So 2 of 4 weeks for Nov! 3 – Add in an extra class each week. I had signed up for a TRX class on thurs this week, but bailed. I was just too exhausted. We were also hosting Thanksgiving for DH’s family on Sat evening so I used the time to do some of the prep work. I did a TRX class the week I couldn’t train with my trainer and I’m signed up for a yoga class this Fri (day after thanksgiving). 4 – Run -well…epic fail. This week I want to run at least 2x. Then try to pick it up to 3x starting next week. 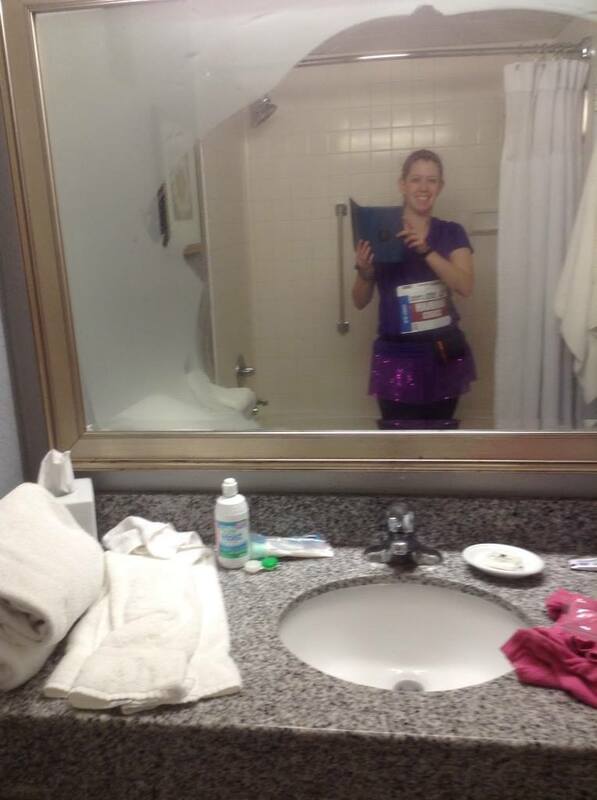 I NEED to do this if I’m going to survive the WDW Marathon in January. I have researched some stretches for my hip so I’m going to be working on those too. 5 – tracking my food — epic fail. I looked at my food journal a couple times. And, I’ve been trying to be more aware. I just haven’t been writing it down. Maybe I’ll get to it this week. Otherwise, I’ll add it to my Dec goals. 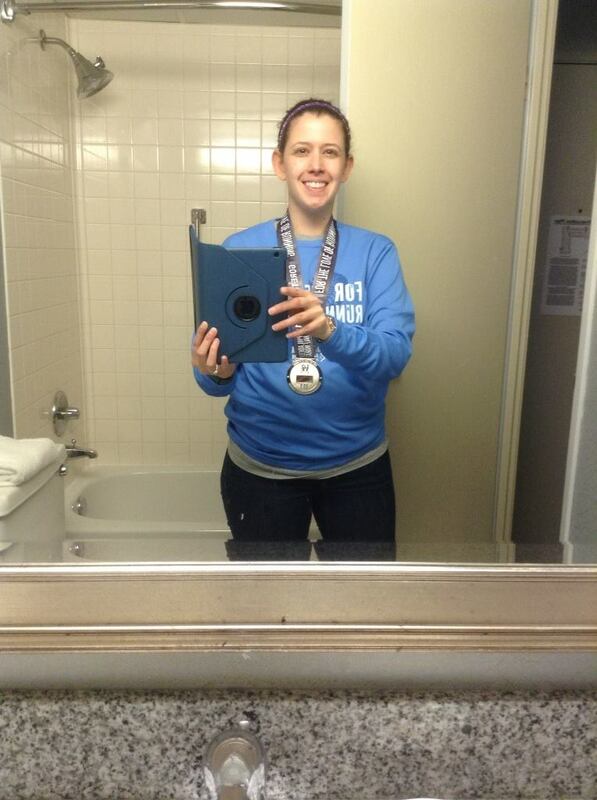 6 – Fitbit — I did this! and then I took it off and forgot to put it back on. I’m going to charge it today and put it back on for the week tomorrow morning. 7 – Homemade food – well…we are working on this. Its always a work in process. I did pack my lunch three days this week. Which is HUGE b/c work has been VERY stressful the last two weeks. 8 – Host Thanksgiving for DH’s family — DONE and a success. We had 9 adults, two kids and a baby. The worse part was that we ended up putting puppers in his crate most of the evening. More for his own protection — from kids who don’t have dogs and food scraps left on the floor (FYI – Sage and nutmeg are dangerous for dogs). 9 – Survive T-Day #2 without gaining too much weight — well have to wait and see on that one. Boot camp halfway weigh in is on Sat 11/30! 10 – Fundraising for spring 2014 TNT — I’m working on setting up a vendor fair on 12/7 so this one is going well! Welp! That’s my catch up! Finally! 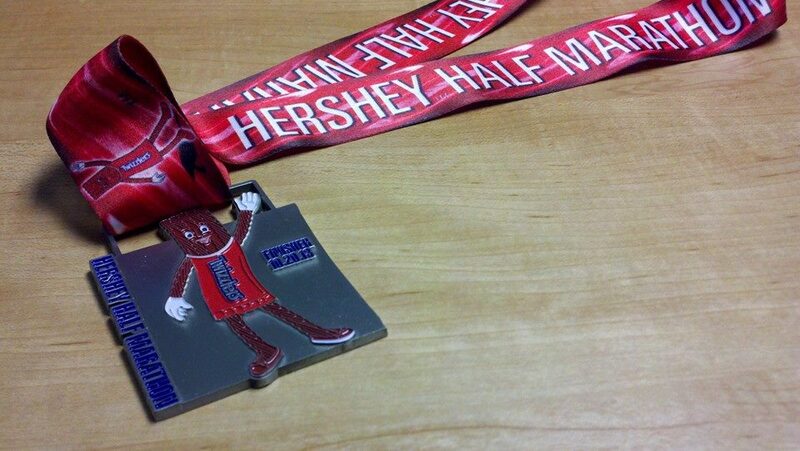 I’m getting to my Hershey Half recap. This was a rough race. It was pretty cold (40ish or less than at the wake up). It is also quite a hilly course. DH came down later and brought our dog to cheer me on. Wow — the puppers decided to be “Super Bad” and try to chase EVERY single car on the roads. 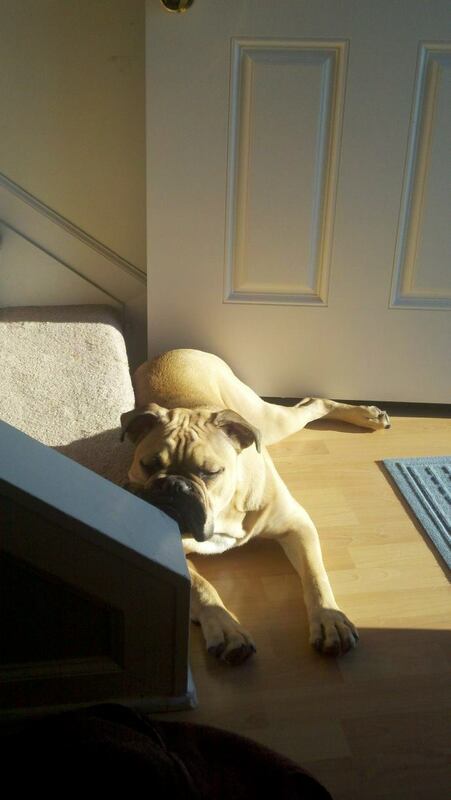 DH was exhausted by the time I finished. And, once again, about two hours after the race it was difficult to tell if it was me or puppers who ran. I am pretty proud of my time at the halfway mark lately. I seem to be increasing my speed and feeling really good by the 10k split or halfway point. 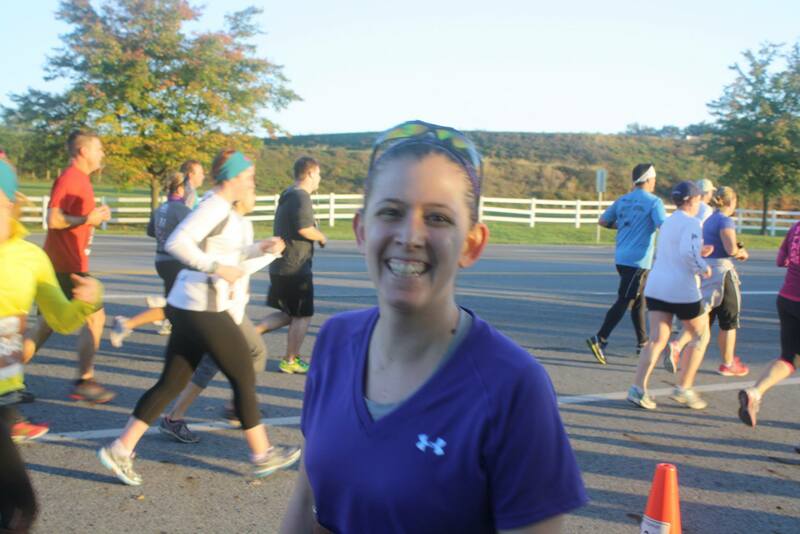 All-in-all I finished with a PR …although not as awesome as one I wanted/hoped for. 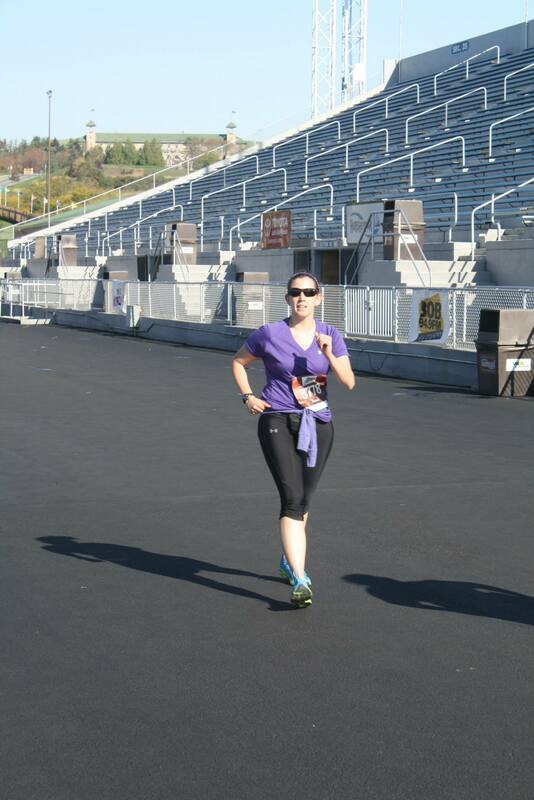 My brother had his camera out along the course and took some photos (my sister-in-law was also running). My hip was really tight and was bothering me quite a bit by around mile 11. I sort of limped my way through the end. 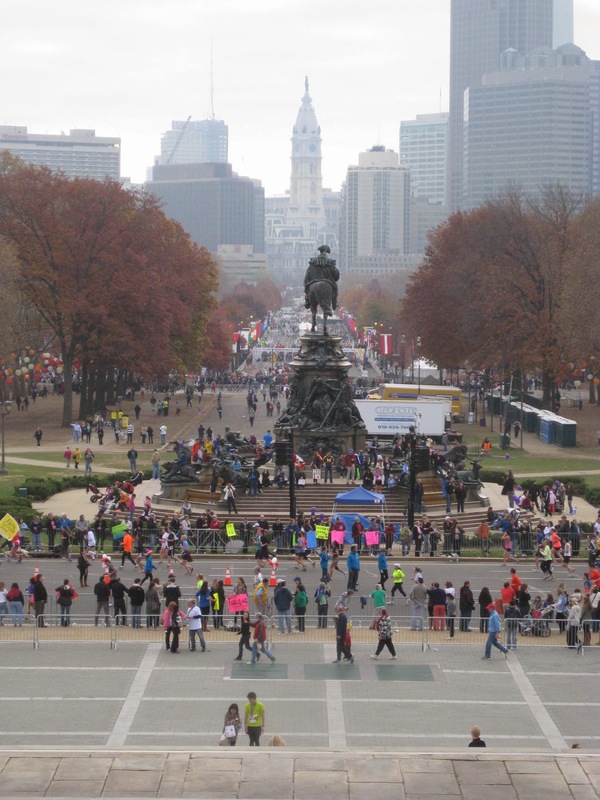 I love that I ran the last bit with a man who had on a Philadelphia Marathon shirt (2012, the 2013 being my next race). Around 11.9 I stopped to stretch my hip at a sign post and he said “come on, don’t give up now, we’re almost there.” I absolutely love the camaraderie at running events! It gives you renewed hope in the human race. Anyways, I finished and then fell asleep. As a half marathon runner you receive two tickets to HersheyPark in theDark. DH and I visited on Nov 1 and had such a good time. We mainly hit up the roller coasters (and realized how old we are getting!). Then headed off to Troeg’s brewery in Hershey for some dinner before getting back home to puppers. THAT was a great day. Wow, October was so fast! 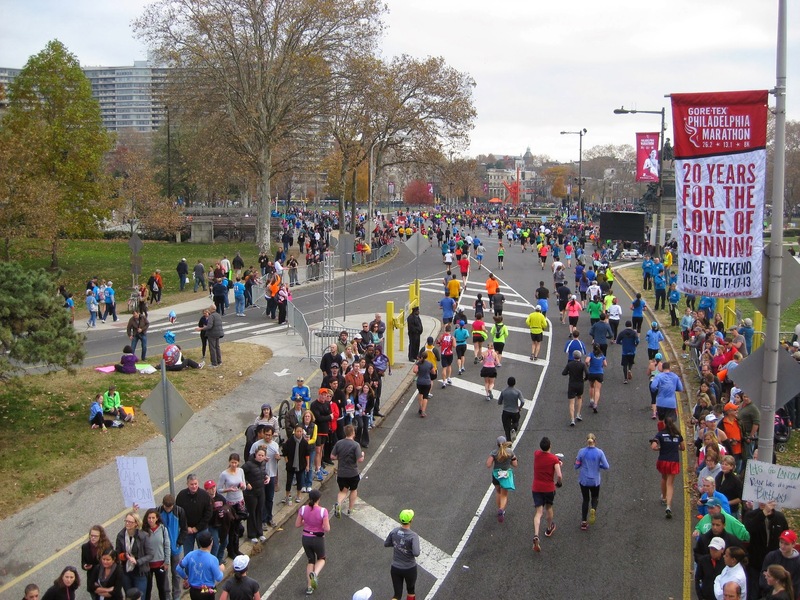 I still haven’t recapped the Hershey Half Marathon — I’ll get to that, I promise! 1 – Start Boot Camp — My gym/studio is offering a 6 week boot camp class. It meets twice a week and includes body measurements and analysis before and after. The first class is this Saturday and I’m super excited and super nervous! 2 – Train with my Trainer — The first two weeks of the month are a bust for this, but I’ll be there on Wednesdays for the last two weeks! Then I need to make a decision as to how to continue b/c my 10-session pass is up at the end of the month. 4 – Run — I really need to get in some long runs in the next two months to prep for the WDW Marathon in January. Next week my goal is two runs during the week, then I’m bumping it to 3x/week for the remainder of the month. That’s it for working out. I do have some other goals this month. 5 – Get back to tracking my food each day. 6 – Start wearing my fitbit again and tracking my steps. 7 – Eat more homemade food and less processed or purchased food. 8 – Host early Thanksgiving with DH’s side of the family. 9 – Survive 2x Thanksgiving without gaining any weight (hoping to lose some!). 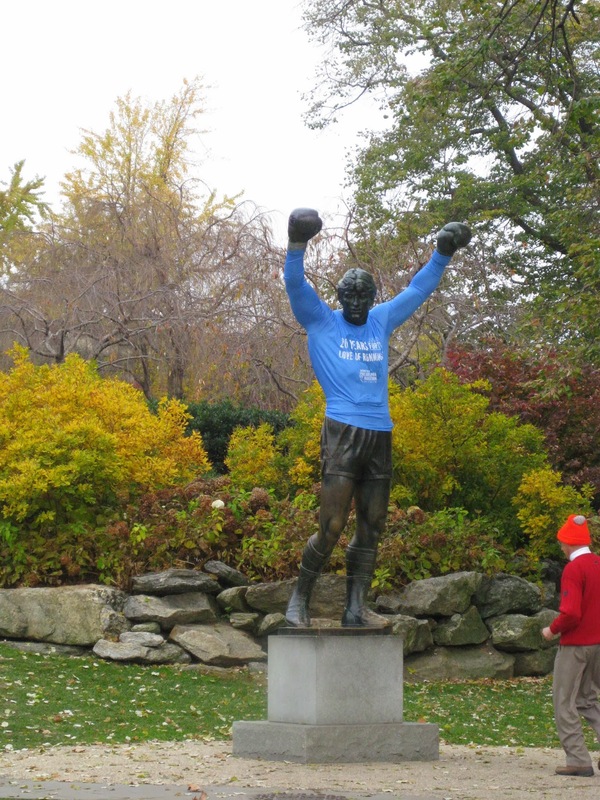 10 -Get a head start on Fundraising for Spring 2014 Team in Training! Well, that’s about it. Do you have any goals for the month?